Life Foundation: House of Cards or Solid Ground? My husband and I visited our daughter and son-in-love over the Labor Day weekend in North Carolina. I love their rental house! If you asked me to draw a floor plan of my ideal home, this would be it. A spacious kitchen, a separate breakfast nook, a formal dining room, a den and a formal living room, with bedrooms down a hall and a walk-in closet in the master bedroom. The best part was a wide house-length front porch. A small deck overlooked a sloping backyard. The house foundation reaches into the side of a hill with the house half-way down the slope and a grove of trees at the bottom of the hill. What’s So Wrong With Worry? Just ask the Israelites of Moses’ day about the high cost of worry. Remember the Bible story about the twelve spies? I love the children’s song that tells the story. Some saw giants, big and tall! (Ten were bad, two were good). Instead of treating the trip as a fact-finding mission, the twelve spies allowed their opinions to cloud their reports. Despite Joshua and Caleb’s attempts to the contrary, ten spies used their emotional reactions to sway the rest of the Israelite camp. “We can’t do this thing,” they basically wailed. The Israelites allowed worry to cloud their judgement and their trust in God. They looked at the obstacle rather than the opportunity. They didn’t believe God really could take care of them. At the core, worry is disbelief. The Israelites paid for their worry big time. You think you’re gonna die? God challenged them. You will die. In the desert. Facing no other enemy but yourself. God raised up a new generation of Israelites who did believe that God could do the impossible. I find this story scary. It’s scary because I’ve been guilty too many times of the very same thing. Worrying that God won’t take care of me. Convincing myself that I’m responsible to fix the problem and I’m not strong enough or resourceful enough to do it. Misdirecting my focus on the problem, not the potential. Forgetting that God is Lord of the possible and that with Him, nothing is impossible. I don’t want to be that way. I want to be a Joshua instead of a no-name scaredy-cat. I’d rather be the vision-caster who says, “Come on, we can do this thing” instead of shrinking back in fear. While I was on vacation, my son-in-law took me out on a motorcycle. “Don’t lean into the curve,” Kevin told me. “Keep your body upright.” As the bike ascended a hill, my bottom wanted to slide backwards and I panicked. Had there ever been reports of injuries from someone falling off the back and landing on their tailbone? I surmised that the principle about curves probably applied to inclines too. Finding my center of gravity, I straightened my spine, leaned forward into Kevin, and trusted his ability to keep us safe. I found out later, that was exactly what I needed to do. Keeping our center of gravity works for everyday life too. Instead of allowing our problems to push us into panic mode, we need to lean forward, stand firm, and trust the One who is in the driver’s seat. Bob Russel, retired minister of the Southeast Christian Church in Louisville, Kentucky, says we worry when we allow our priorities to get out of whack. That was true of the ten spies. They failed to keep the main thing the main thing. They forgot about the wonderful things God had done, including the big one of getting them out of Egypt. If God could rescue them from Pharaoh’s hand, conquering Jericho was a walk in the park! God is an ever-present God.He is already in the future, devising His best plans for our good and His glory. We can trust Him to have all the resources we need and more besides. What’s the problem with worry? For me, it is very tempting right now to worry about the damage Hurricane Florence will do to the Carolina Coastline. My daughter, son-in-law and many friends live in the path of the flooding that will inevitably come. The beach I strolled on during a recent vacation is about to be recarved by a ten-foot storm surge. There is nothing I can do to stop or alter the course of that hurricane. Yet I know the One who can. I know the One who is able to stop the storm surge from going any further than He wills it to go, and He will be with the people who cry out to Him. He’s promised. Worry solves nothing. Worry compounds the problem. Trust hands the controls over to the One who has the power to intervene. Trust in God is ultimately far more effective than worry. Worry compounds the problem. Trust hands the controls to the One with the power to intervene. 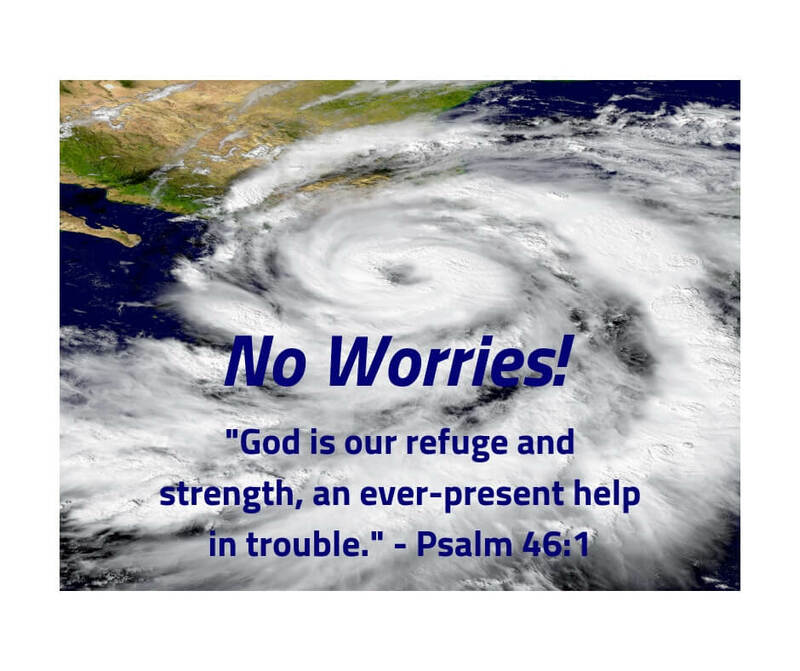 What circumstances tempt you to worry? Step out in faith, do what you can, but leave the rest to God. Watch Him do what you don’t think can be done.